So, while the cruise giants might employ the trendy “First” coast, employees are 22 days on and 22 off. For the Antarc- tic and Explorer segment, people are on “longer.” Despite the mantra for ? rst-time diversions on board ship, it’s also un- derstandable that seeing the Hurtigruten’s “weapons-trained” sea time, Hurtigruten is regularly in the “best employer” dis- cussion locally. Local business sources call it “an extremely expedition leaders in action might also be a “? rst at sea” expe- solid” place to work. 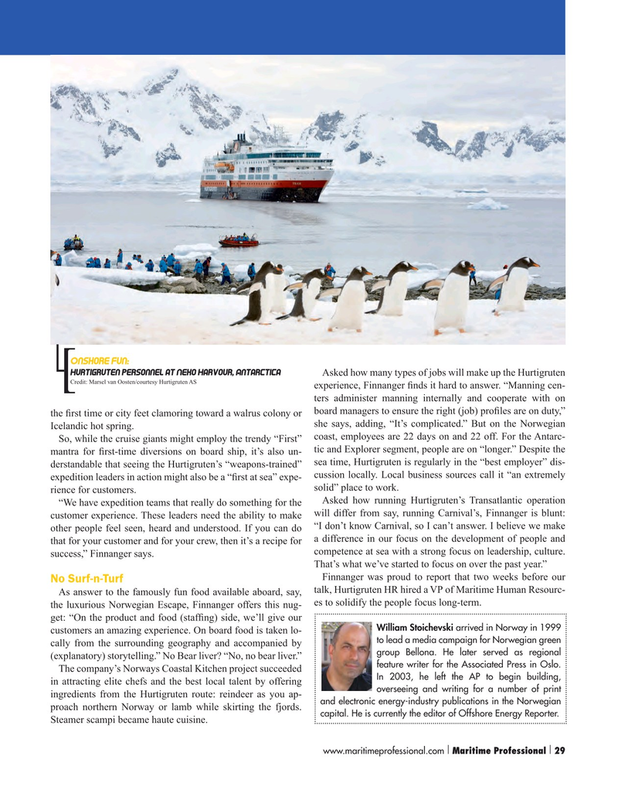 Asked how running Hurtigruten’s Transatlantic operation “We have expedition teams that really do something for the customer experience. These leaders need the ability to make will differ from say, running Carnival’s, Finnanger is blunt: other people feel seen, heard and understood. If you can do “I don’t know Carnival, so I can’t answer. I believe we make that for your customer and for your crew, then it’s a recipe for a difference in our focus on the development of people and competence at sea with a strong focus on leadership, culture. success,” Finnanger says. As answer to the famously fun food available aboard, say, talk, Hurtigruten HR hired a VP of Maritime Human Resourc- es to solidify the people focus long-term. William Stoichevski arrived in Norway in 1999 customers an amazing experience. On board food is taken lo- to lead a media campaign for Norwegian green cally from the surrounding geography and accompanied by group Bellona. He later served as regional (explanatory) storytelling.” No Bear liver? “No, no bear liver.” feature writer for the Associated Press in Oslo. In 2003, he left the AP to begin building, in attracting elite chefs and the best local talent by offering overseeing and writing for a number of print ingredients from the Hurtigruten route: reindeer as you ap- and electronic energy-industry publications in the Norwegian proach northern Norway or lamb while skirting the fjords. capital. He is currently the editor of Offshore Energy Reporter. Steamer scampi became haute cuisine.